The Panasonic ES-LT3N-K is part of the latest generation Arc 3 family of electric shavers introduced back in 2016. 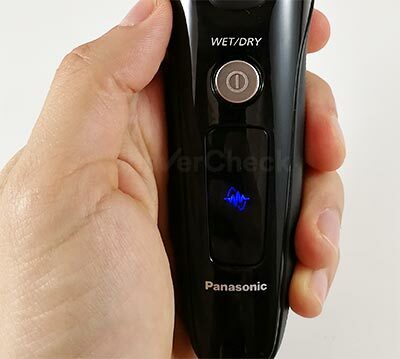 It is undoubtedly the most significant update the Arc 3 line has seen so far and one that could bridge the gap between entry-level and high-end Panasonic electric razors. As a result, the expectations were very high, especially since the previous models have been extremely successful and are still going strong despite their age. In this review we’re going to take a close look at what will likely be the best-selling model of this new Arc 3 iteration, the ES-LT3N-K. We’ll also see how it compares to the older razors and if it lives up to the hype. Shave sensor technology — does it work? Who should buy the ES-LT3N-K? The Panasonic ES-LT3N-K is one of the three new models available on the North American market, the other two being the ES-LT5N-H and the ES-LT7N-S.
As you can see, the ES-LT3N-K in our review is the basic, entry-level version and it doesn’t include a charging stand or a cleaning station. It also features an all plastic body instead of a metal front fascia. On the bright side, it is priced significantly lower than the other two models and since the Arc 3 is geared towards the budget-conscious buyer, I’d say that the ES-LT3N-K is actually the pick of the bunch. Our model is a 3 blade electric shaver featuring Panasonic’s trademark arched profile of the shaving head, hence the Arc 3 name. The shaving system is comprised of two outer foils that cut stubble close to the skin and one middle trimmer for catching longer hairs. As usual, the two inner blades that oscillate behind the foils are separated from the foil block. It is much easier to clean the shaver manually compared to other brands (for example, Braun). The blades feature the same 30 degrees bevel that allows a very clean and efficient cut. In my opinion Panasonic makes some of the best blades in the industry. With this new Arc 3 update, Panasonic now offers what is likely the most advanced flexing shaving head of any entry-level foil shaver. The head of the ES-LT3N-K can move on three axes: left to right, up and down, back and forth. The movement of the head is buttery smooth, a lot smoother compared to the previous generation. This will supposedly help with maintaining contact with the skin when shaving different areas of your face. Since the head can also be depressed now, it will prevent excessive pressure from being applied and will hopefully reduce razor burn (we’ll see how good this actually works in the performance section of the review). The Panasonic ES-LT3N-K is fitted with a punchy 13 000 cycles per minute linear-drive motor. But unlike the previous generation Arc 3 shavers, this new model also comes with a sensor that can read the beard density and adjust the power output accordingly. I have always been skeptical about the effectiveness of such technologies as they don’t really seem to work in real life, so stick around to find out if the ES-LT3N-K is any different. 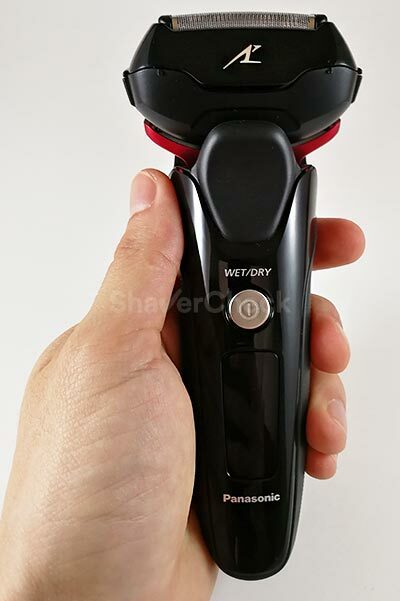 As all modern Panasonic shavers, this one is fully waterproof and can be used in the shower, rinsed with water or used with your favorite cream or gel. This also means that you cannot use it while it’s charging. And speaking of charging, the automatic universal voltage converter (100-240v) allows you to use the ES-LT3N-K anywhere in the world. As mentioned previously, the Panasonic ES-LT3N is the entry-level model in the new Arc 3 family. So instead of the brushed silver metal, it features a glossy plastic front. While it won’t feel as nice and expensive as the other two models, the ES-LT3N-K is still quite a looker. The all-black color scheme, along with the matte red highlights around the shaving head look stunning in person. 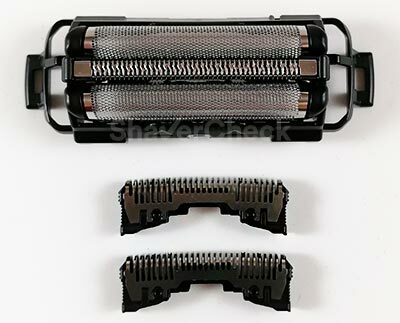 The plastic on the front and on the foil frame has a high gloss finish, while on the bottom half of the shaving head and on the trimmer slider it features a matte treatment. Everything just oozes quality and feels extremely well built. There are no gaps between the different panels and the materials are of high quality. The glossy plastic does show smudges and fingerprints, but it doesn’t scratch as easily as you would think. And judging by how well my other glossy Panasonic razors have aged, I’d say that the ES-LT3N-K will do just fine. 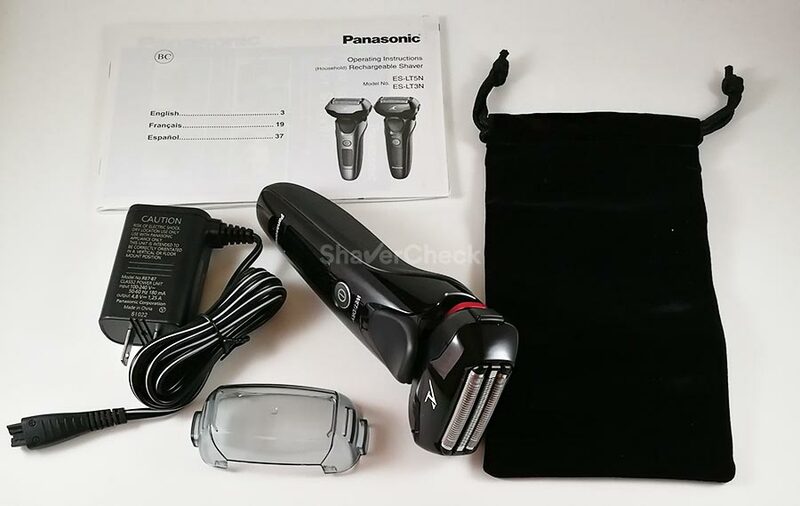 This model only goes to show (again) that Panasonic shavers currently have the best build quality, even though the Arc 3 is considered to be their entry-level line. Let’s take a closer look at the ES-LT3N-K.
On the front, right below the shaving head, we have a thumb rest that wasn’t present on most of the older Arc 3 models. Further down there’s the ON/OFF button that also doubles as a travel lock when pressing and holding it for more than two seconds with the shaver turned on. Finally, we have the multi-LED display that shows you the battery percentage in 10% increments. Unfortunately it doesn’t show the duration of your shave like other Panasonic razors do. On the back and sides there’s a textured rubber-like material that ensures excellent grip even when the shaver is wet or covered in lather. 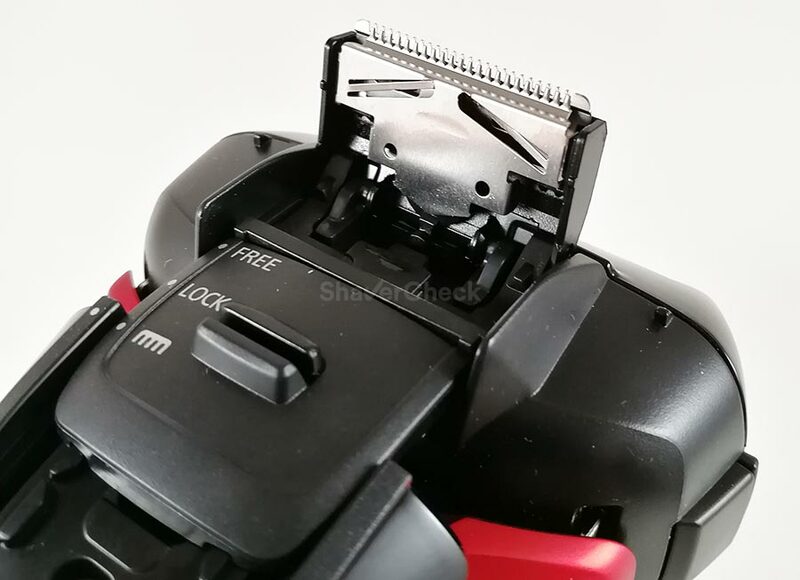 Also on the back of the ES-LT3N-K we have the popup trimmer located on the shaving head itself. Trimmer — which deploys the popup trimmer (the shaving head is still locked in this position). The three round dots on the back are just rubber blanks instead of the metal studs found on the ES-LT7N-K version that comes with the automatic cleaning station. The ES-LT3N-K feels great in the hand, is nicely balanced and the slim, sculpted body ensures a very comfortable and secure grip. Ok, time to complain now. The biggest problem with the ES-LT3N-K and with all the newer Arc 3 models is in my opinion the size of the shaving head. It is unnecessarily bulky and wide given the slim 3 blade shaving system. You can see it below next to an Arc 4 (ES-LA63-S). It is not entirely obvious from the image, but its size is very similar to the Arc 4 model despite having only 3 shaving elements. The head of the Series 5 is narrower even though the actual foils are wider. And you can really feel the size of the head during use, especially when shaving below your nose and jawline. It feels similar to the larger 4 blade ES-LA63-S.
Other Arc 4 models like ES-LA51-A Arc 4 actually manage to have a smaller head — again, despite having more blades. I eventually got used to its proportions, but I can see this being a problem for other users. If I were to nitpick on the ergonomics of the ES-LT3N-K, I would say that the thumb rest is placed a bit too high for my liking; I find placing my thumb right below to be a more comfortable and natural position. And this leads to my second (minor) gripe. The ON/OFF button takes very little force to operate and I found myself accidentally turning the razor off during my shave if I didn’t place my thumb on the rest pad and just wrapped my hand around the shaver’s body. This isn’t a problem with other shavers since the power button is usually a lot harder to press. Let’s now see what you’ll be getting inside the box. User’s manual, cleaning instructions and warranty card. Even though the ES-LT3N-K is the entry-level model in the new Arc 3 series, I was still a bit surprised to see that they didn’t include a small cleaning brush. 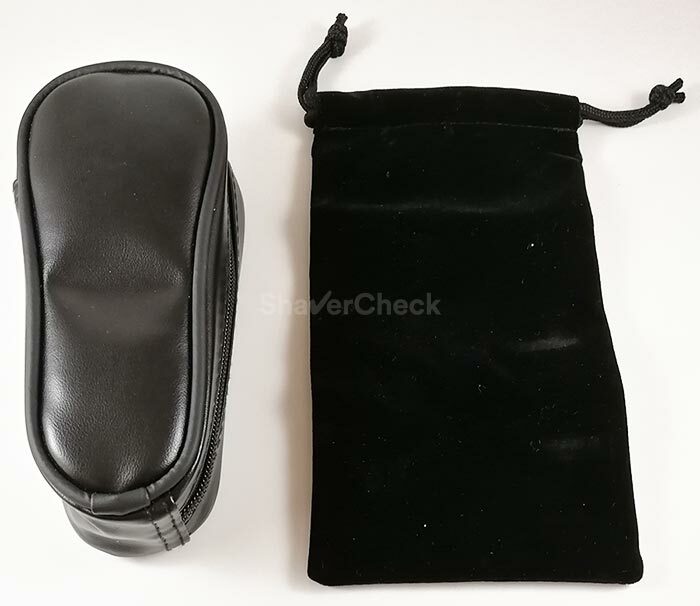 The travel pouch was another letdown; while the Arc 4 and Arc 5 come with a faux leather travel pouch that doesn’t offer the greatest protection but at least it looks good, the ES-LT3N-K comes with this cheap, soft, velvety pouch that’s pretty much useless. It wouldn’t have been a big deal in the case of the previous generation Arc 3, but given the price bump, I was expecting more. Out of the box, the battery of my ES-LT3N-K was completely depleted and the shaver wouldn’t even turn on. Being a wet/dry shaver, it can only be operated cordless, so I plugged the cord and the shaver started charging. It took roughly one hour to go from 0 to 100%; there’s also a handy 5-minute quick charge feature that allows you to complete one shave when you’re caught off guard. During charging the corresponding lamp will light up on the LED display and it will also show the progression in 10% increments. The charging cord included by Panasonic is really long, measuring almost 2 meters and the brick is compact and light. My unit was bought from the USA and came with a USA power plug, but this can vary depending on where the shaver is being sold. The battery life of the ES-LT3N-K is pretty standard, meaning you’ll get around 40 to 45 minutes worth of shaving time from a fully charged battery. Being a modern Li-ion battery, you can charge it whenever you want without any worries that it will affect its performance in time. The same goes if you leave your shaver plugged in after reaching 100%. Panasonic even mentions these aspects explicitly in the user’s manual and I have to give them props for that. There are still some myths about charging and battery life that were carried over from the old NiMh batteries and still cause a lot of confusion among users. In short, just charge your shaver whenever you want. The LED display is pretty useful for showing you the status of the battery; it’s definitely better than the one on the new Braun Series 7 for example. The battery percentage is only displayed for 5 seconds upon turning the shaver off. However, I do find it odd that it won’t show the battery percentage upon turning the shaver on and only displays it for 5 seconds once you turn it off. There are 6 segments arranged in a circular pattern, 5 of them corresponding to a 20% battery charge and one that signals a low battery. But the really useful information is shown above it, an actual number that represents the percentage of the remaining charge. As you use your shaver, it will go down in increments of 10%. During use the only thing shown on the display is an animation of the shaving sensor. It’s pretty useless since you can’t actually deactivate the sensor. Right, let’s get down do business and see how well the Panasonic ES-LT3N-K shaves. In order to get an accurate image of this shaver’s performance and versatility, I tried using it in various scenarios. I shaved daily, every other day and even used it on a three-day beard. I shaved dry, with and without a pre-shave, but also with shaving cream which is something I particularly enjoy with Panasonic razors. Here are my thoughts after almost three weeks of constant use. As usual, we’ll break down the performance part of the review into several relevant and distinct parts. Upon first turning the shaver on, I immediately noticed that it is quieter compared to pretty much any other Panasonic I’ve used in the past. Not by a whole lot, but still noticeably quieter. It emits a very clean and crisp whine, with minimal vibrations induced to the shaver’s body. It is still louder than a rotary shaver though and it would probably wake up someone sleeping nearby, so don’t expect anything spectacular in this regard. Shaving dry with the ES-LT3N-K doesn’t quite offer the best experience, at least not in my case. The closeness is really good as long as you don’t have a very sensitive skin. Unfortunately I do and shaving my neck and right below the nose wasn’t too enjoyable. I had to be extra careful not to apply too much pressure, especially on the neck, where during and after the shave I did get some stinging and redness despite my efforts. Luckily, the discomfort didn’t last too long, but other shavers like the Braun Series 5 are more comfortable during a dry shave. Because of this, the closeness on the neck and above my upper lip where I have very thick and dense stubble wasn’t quite what I was hoping for. Again, this happened solely because Panasonic razors are usually too aggressive for my skin when I shave dry. For someone that doesn’t have an irritation-prone skin, the Panasonic ES-LT3N-K will likely provide a very close shave. In fact, on my cheeks and chin where I can get away with a more aggressive shave, the closeness was great. Using a pre-shave made the foils glide a bit easier on the skin, but I didn’t notice other improvements to the comfort or to the closeness of the shave, which to me is a bit unusual. And speaking of gliding, this shaver would sometimes skip and hop over the skin. 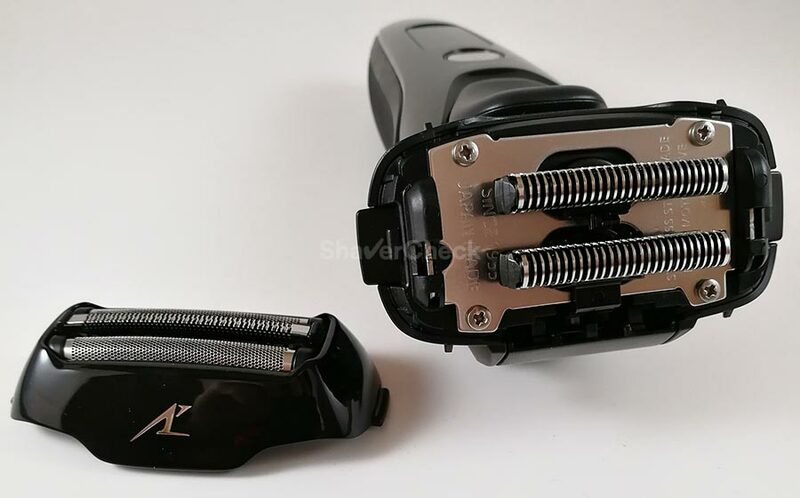 First I thought that I was doing something wrong, but when used side by side with other shavers this issue was a lot more noticeable with the ES-LT3N-K.
After a few more shaves I found the culprit: the extremely flexible shaving head. To my surprise, locking the head in the fixed position reduced this behavior and actually made the shaver more maneuverable and easier to use. Unfortunately the advanced flexing capabilities of the ES-LT3N-K shaving head just made it wobbly and actually had a negative impact on the performance. It’s a bit too much of a good thing I guess. And this was even more obvious when shaving a two or three-day beard. Precisely, I have lots of flat-lying hairs on the neck that aren’t such a big deal when I shave often. But once they grow long enough and lie flat on the skin, getting them with this shaver was no fun. So the flat hairs are still a problem for the new Arc 3 models as well. 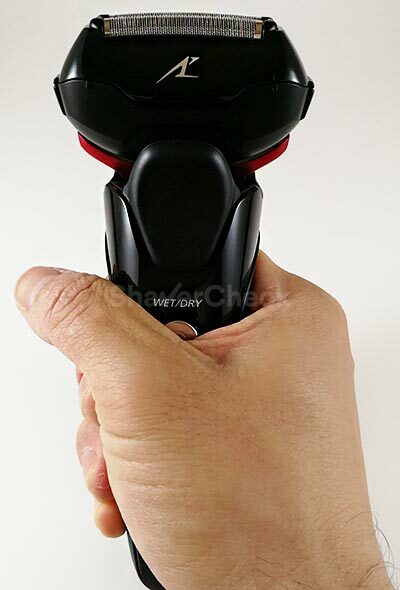 The shaver would often miss them even after repeated strokes and since I have very sensitive skin on the neck, this would also leave me with a rash. I eventually had to get those stray hairs using the shaver’s popup trimmer. In conclusion, if you have lots of hairs that lie flat and don’t intend to shave daily, you might want to skip the ES-LT3N-K.
And to be perfectly honest, no Panasonic is particularly good in this situation. The solution is to either shave more often or consider a different shaver — the ones from Braun are clearly superior here. And yes, the problem of flat hairs is made worse by the highly flexible head. In the locked position it actually missed fewer hairs and I was able to finish my shave faster. Overall, the Panasonic ES-LT3N-K is extremely similar to the previous 13 000 CPM Arc 3 shavers in terms of closeness and comfort. You will be pleased with the performance as long as your skin is not too sensitive and you’ll be using it mostly on short stubble. I personally prefer the older ones for the narrower shaving head and the lack of the sensor technology (I’ll explain why later on). If you’re into wet shaving like I am, you’ll probably be very happy with this shaver. Just like pretty much every modern Panasonic electric razor, it performs outstandingly when used with shaving cream. The comfort was noticeably better in my case and I got a closer shave as well, especially above my upper lip where I wasn’t quite happy with the results of a quick dry shave. However, shaving longer, flat-lying hairs is still an issue; in fact, the lather would often cover those stray hairs and I would only notice them after rinsing my face with water. So I have to say it once more, I can only recommend this razor if you plan on shaving more often or if your whiskers stand (mostly) straight. In short no, it doesn’t. At least not in the sense of actually improving your shave. The ES-LT3N-K is fitted with a 13 000 CPM motor, the same as some of the older Arc 3 models. But in this case a sensor will read the density of your beard and adjust the output of the motor accordingly. This basically means that it will slow down the razor if the sensor thinks your beard doesn’t require all the power the motor is capable of delivering. It all sounds good, but it doesn’t really work as it should. I found this technology to be very inconsistent with the ES-LT3N-K. Once I start shaving an area, let’s say the neck, it would up the power after a few seconds (there’s a noticeable increase in the sound) then it would gradually decrease it back to the starting point. Sometimes the power would spike again and not necessarily when dealing with thicker hairs, then slow down again. When using shaving cream the sensor doesn’t seem to work at all since I didn’t notice any change in the pitch, even though I listened very carefully. This is normal according to Panasonic, but I beg to differ. It just doesn’t work as advertised. So to sum it up, this technology just slows down what is actually a very nippy and fast motor without any improvements to the comfort and overall results. In theory it sounds good, but it just doesn’t work and in the case of the ES-LT3N-K it’s nothing more than a marketing gimmick. You’ll want your shaver to work at full speed throughout your entire shave; this will translate to better performance and improved comfort, without pulling the hairs. I wouldn’t have a problem with this if I could simply deactivate the sensor mode like on other Panasonic shavers, but you can’t do that. And it’s a real shame because in my opinion it doesn’t do anything to improve your shave and even worse, it could actually be detrimental to the shaver’s performance. 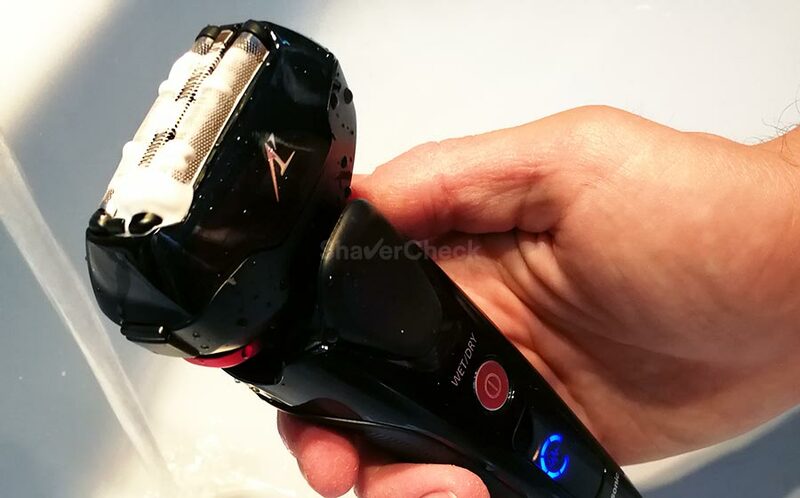 This Panasonic has arguably the best trimmer I’ve ever used with any electric shaver. It cuts the hairs effortlessly, it’s so smooth and refined during use that at first I thought there’s something wrong with my review unit. Compared to the dull trimmers on Braun shavers, this one is very sharp, it has a straight edge as opposed to a rounded one and it works flawlessly. Granted, it’s not ideal for trimming an entire beard, but for what it’s intended to do — trimming and shaping your sideburns/ mustache/goatee — it absolutely shines. The switch is also buttery smooth to operate, unlike the ones found on other shavers. The position is not too bad either, being placed close to the top of the shaving head, so you can actually see what you’re doing. 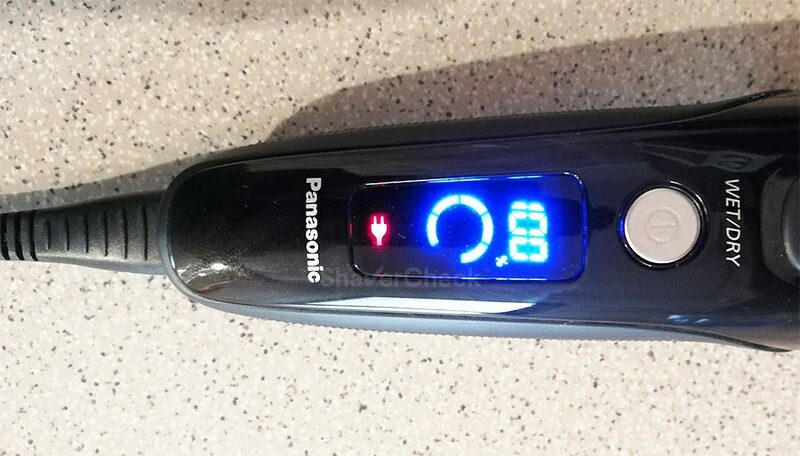 I’ve been using electric shavers for more than 15 years and Panasonic has constantly been the best with regards to the ease of cleaning and maintenance. And it appears to be the case with the ES-LT3N-K as well. A manual cleaning will be your only option since only the much more expensive ES-LT7N-S comes with an automatic cleaning base. But to be perfectly honest, you absolutely don’t need one. Yes, it is an excellent cleaning station, but hardly necessary. The Arc 3 is extremely easy to clean due to a few key aspects: the inner blades can be separated from the foils block, it is fully waterproof and has a dedicated cleaning mode which I’ll get to right away. I mentioned previously that the retail package doesn’t include a cleaning brush, but again it’s not a big deal since the best way to clean this razor is to rinse it with water and (optionally) a bit of liquid soap. Once you’ve finished shaving, squeeze the two buttons located on either side of the shaving head to release the foil frame, then gently tap the bottom part on the edge of the sink to remove most of the hairs. You can also blow over it and over the inner blades to remove more hair clippings. At this point you could just rinse the foils and blades with warm tap water and call it a wrap, but my recommendation would be to use a bit of liquid soap for a more thorough cleaning. Snap the foil frame back in place, add a bit of water and put a few drops of liquid soap on the foils. Press and hold the ON/OFF switch to enter the sonic cleaning mode. Once activated, you will notice a change in the pitch of the sound and the blades will start oscillating extremely fast, dislodging any debris. This cleaning mode also prevents splashes, so I like to add a few drops of water while it’s activated so the soap can lather nicely. 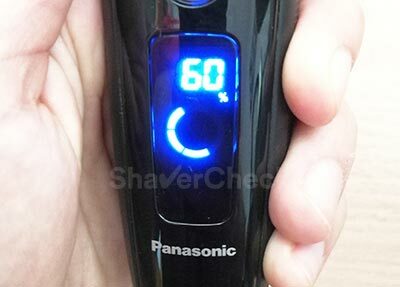 The shaver will automatically turn off after 20 seconds, but you can do it sooner by pressing the power button. With the razor turned off, remove the foils and rinse them with tap water. 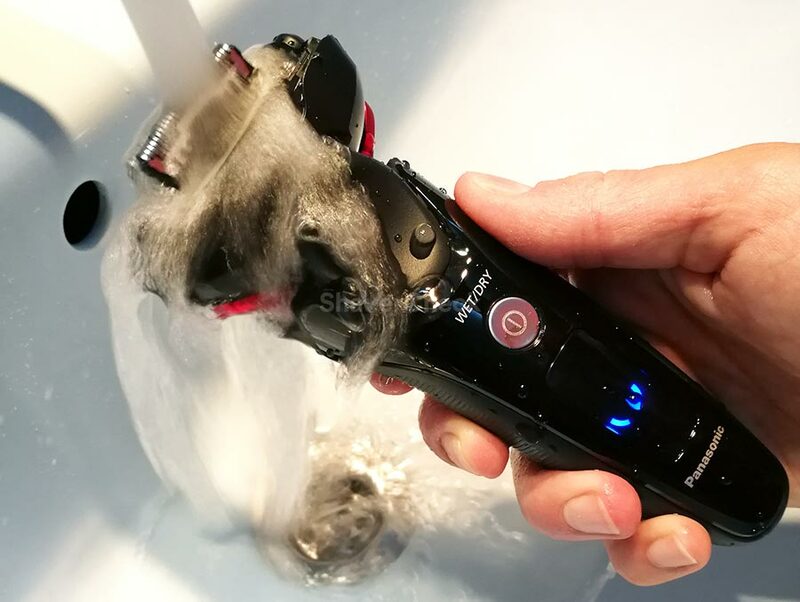 With the inner blades still exposed, press and hold the power button to start the cleaning mode again and rinse the blades and the body of the shaver with water. The sonic mode is very handy in this situation because it doesn’t splash water all over the place. If you try to do this in the standard shaving mode it will make a big mess. Shake off the excess water, pat dry with a towel and let it air dry completely. 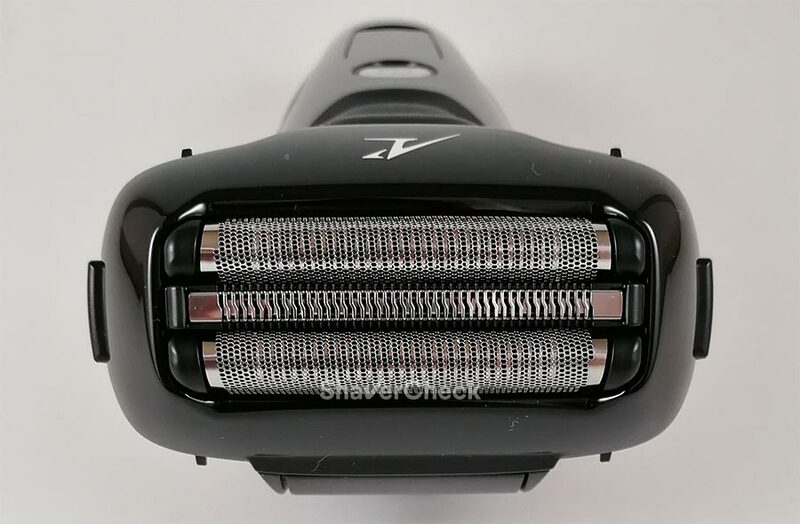 I know this sounds like a lot to be done when you read about it, but I guarantee you that it literally takes 30 seconds and your shaver will be perfectly clean afterward. Maintaining this shaver (or any other shaver) in top shape mainly comes down to proper cleaning and lubrication. We took care of the first part, now let’s see how to lubricate the ES-LT3N-K. The use of soap will remove any form of lubrication, so it’s important to manually apply some lubricant yourself. You have a few options: clipper oil, sewing machine oil or a spray cleaner and lubricant like the Remington Shaver Saver. Whichever one you choose, it will make a big difference to the lifespan of the blades and will improve the comfort during the shave, reducing the friction and the generated heat. Here’s a detailed guide on when and how to lubricate your razor. The replacement foils and blades for the Panasonic ES-LT3N-K Arc 3 can be bought separately or as a combo. This can help you save some money if you need to replace just the foil block or the inner blades. 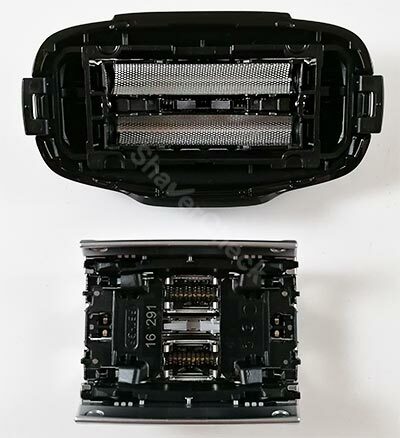 It’s interesting to note that the two inner blades are the same ones used on the older generation Arc 3 shavers and also on the Arc 4 models, while the foil block is new and will only fit the ES-LT3N-K and the other new Arc 3 models. The manufacturer recommends replacing the inner blades every two years and the outer foils every year. This will however depend on the coarseness of your beard, how often you shave and how well you take care of your razor (cleaning and lubrication). Panasonic foils and blades have always been pricey and it’s the same story with the ES-LT3N-K. For example, these parts will cost more than what you would pay for a Braun Series 3 or 5 shaving head. This new generation Arc 3 wasn’t significantly better than the previous generation Arc 3 during my tests. 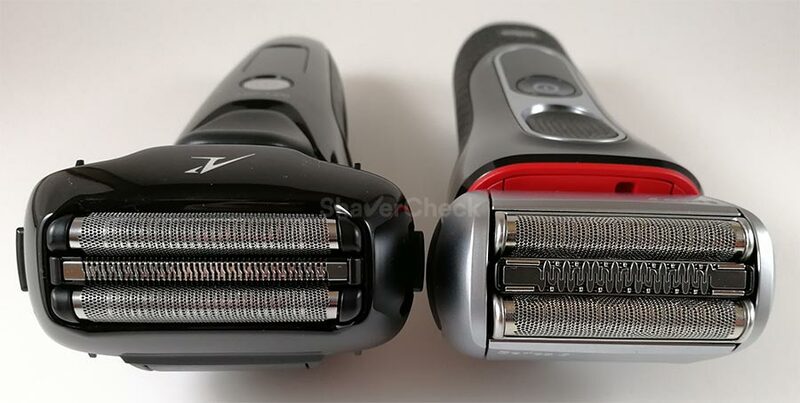 Yes, the design is nicer, the shaving head has some impressive flexibility and the hair trimmer is better, but the overall results — closeness and comfort — were pretty much the same. To me this didn’t really come as a surprise even though I was extremely excited to test the new Arc 3 shavers. The inner blades are the same as the ones on the previous generation and the foils block looks awfully similar despite having a different part number. 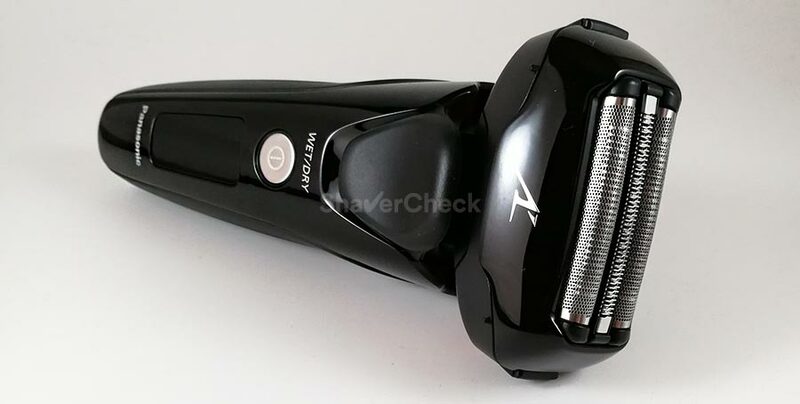 Regarding who should buy the ES-LT3N-K Arc 3, I would say that it would be a suitable razor for someone who doesn’t have a sensitive skin and needs a quality shaver for everyday use. Also, if you’re willing to give wet shaving a try, this shaver will not disappoint you and you’ll get excellent results (but again, assuming you won’t have to shave lots of flat-lying hairs). This pretty much concludes our Panasonic ES-LT3N-K review. Considering its overall performance relative to the older Arc 3 models, its price and its negatives, I’d say that it falls a bit short of being a really great shaver. The ES-LT3N-K is still a good performer despite its flaws, but there are other electric razors that shave at least as good for even less money and have fewer shortcomings. For example, the Arc 4 models come with an extra blade and pretty much the same size of the shaving head, the motor is at least as powerful (13 000 or 14 000 CPM) and the replacement foils and blades are priced similarly. None of them has the advanced flexing head of the ES-LT3N-K, but you won’t really miss it. In fact, I would have preferred a more compact shaving head (like the one on the previous generation Arc 3) instead of this big wobbly thing. 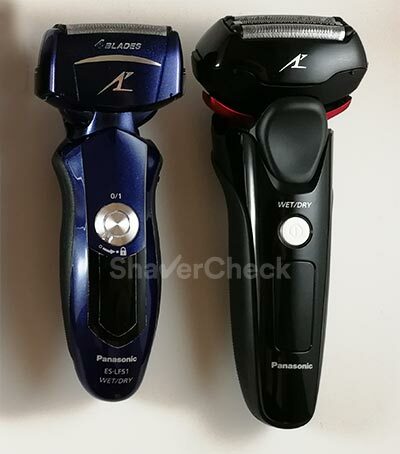 With that said, here are two shavers that in my opinion represent better alternatives to the ES-LT3N-K. The first one is obviously an Arc 3 from the previous generation. The ES-LT41-K is one of the more reasonably priced models, but you could also opt for the Panasonic ES8103S since the performance will be very similar. 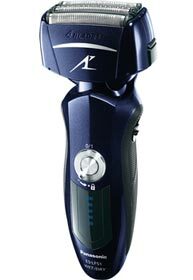 Its shaving performance will be similar if not better (constant maximum power, more compact shaving head). If you can’t buy the ES-LT41-K in your country, any market specific 13 000 CPM Arc 3 model from the older generation will basically perform the same, so just get the cheapest one you can find. The other option is a razor from the Arc 4 line, the ES-LF51-A. This shaver is equipped with an even more powerful 14 000 CPM motor and has a surprisingly slim shaving head for a 4 blade shaver. In fact, it is more compact than the one of the ES-LT3N-K that features 3 blades and that says a lot. This is one of my favorite shavers mainly because it shaves incredibly close. It’s also very fast and powerful and suitable for very coarse and dense beards. In my experience it is similar to the ES-LT3N-K with regards to comfort, but it shaves closer and faster and it’s more maneuverable. If you can get it for a similar price, I would definitely recommend this one instead. Yes, its design is looking dated next to the new Arc 3, but the shaving performance is what matters the most and the ES-LF51-A really delivers in this regard. The direct competitor of the Arc 3 is Braun’s Series 3, but it doesn’t shave quite as close as the Panasonic shavers, but it is significantly more comfortable. Please keep in mind that no Panasonic shaver excels in comfort or when shaving longer, flat-lying hairs, so if that’s the case you should probably consider a Braun Series 5 or a Series 7 if your budget allows it. Home » Reviews » Panasonic ES-LT3N-K Review: Is The New Arc 3 Worth Buying? Thanks for this review. I never would have thought it would be so hard to differientate between the various models from the same manufacturer! Then you have to take into account country specific model variations! I normally wetshave with a DE, and since I have sensitive skin, would countinue to wetshave. I like a close shave too thus my decision to go with a Panasonic. Looking throught your reviews I really like the arc 5 with the pivot head etc etc, however as I have a ‘small’ face really prefer the slimness/maneuverability of the ES-LF51, especially after reading your recommendations. My Questions is: is there an arc 5 variation of the ES-LF51? Thank you for your comment. The Arc 5 alternative to the ES-LF51-A would be the ES-LV61-A. However, that one is an older model that now costs more than some of the newer Arc 5 shavers. For this reason I actually recommend you to check out the ES-LV65-S. You can read my review of it here. It is an excellent shaver, especially for the money. It does have a larger head than the ES-LF51-A, but I only find it troublesome when shaving under the nose. Hi. I am a Korean reviewer. I’ve read your electric shaver reviews very well, and they’ve been very helpful in my review. I am currently using Arc5 ES-LV5C and ES-LV65. I was satisfied with the performance of these products and recommended them to others. As I wrote a review on products, I became curious about Arc3, Arc4 products. 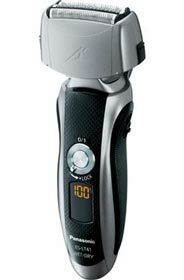 Panasonic electric shaver distributed in Korea are limited and more expensive than in other countries. I would like to recommend a foreign model with a more reasonable price and good performance to Koreans. So I want to buy one of the following products and test it. Currently, ES-LT2A is cheaper than ES-LF51. Your review attracted ES-LA63 but gave up because it did not seem to have a price advantage over ES-LV65. I’m looking for an electric shaver under $100. You’ve used all the products. What would you buy? I am not sure if my meaning will be conveyed well because I am not good at English. Thank you for reading. I wish you the best in the New Year! Between the ES-LT2A/ES-LT3N and the ES-LF51-A, I definitely prefer the latter. 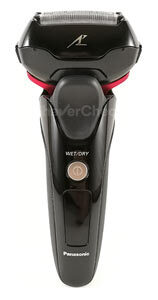 It feels faster and more powerful, it shaves closer and it feels more nimble despite having an extra cutting element. For this reason I would actually prefer it over the ES-LA63-S which has a bulkier foil frame. So the ES-LF51-A Arc 4 would be my personal pick. There was a part where my English was immature and did not understand your reviews well. But when I saw your comment, I could understand your intention correctly. Thank you very much. I’m going to buy ES-LF51. I’ll visit again if I have a chance. Bye! You are very welcome. Please do, I’m looking forward to hearing your thoughts on it.